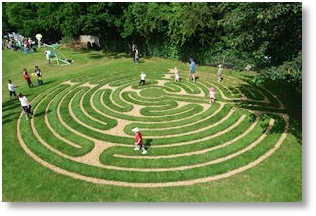 Thinking of building your own labyrinth or maze and not sure where to begin? Need help with design ideas, thoughts on suitable materials or locations? 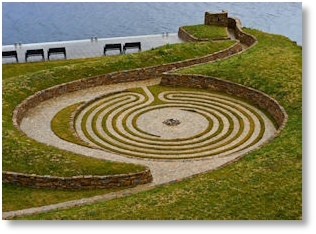 Labyrinthos has been involved with the design, construction and restoration of numerous labyrinths and mazes over the years and can provide advice on all aspects of the process, assistance with design choices and suggestions for construction materials. 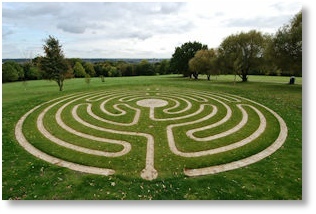 Based in England, but working internationally, we specialize in replicas and adaptations of historic labyrinths and mazes, as well as more contemporary styles, and can also provide documentation for proposals & plans, measurements and instructions for layouts, etc. 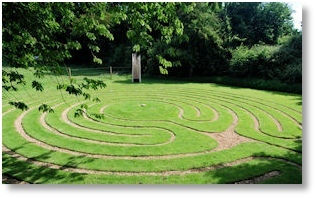 Right: Turf labyrinth, St. Patrick’s Purgatory, Lough Derg, Ireland, constructed 2004. Design consultancy by Labyrinthos, in conjunction with Marcus Flannery Landscape Architects. 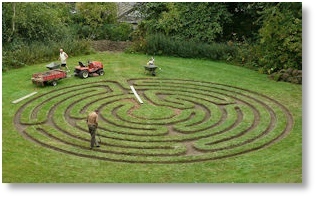 Left: Turf labyrinth, 115% scale replica of the Chartres Cathedral labyrinth, stone set in turf, 2004. 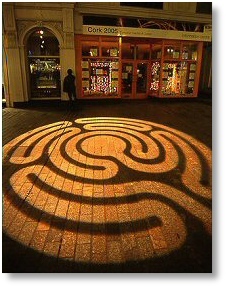 Design by Labyrinthos, constructed by The Labyrinth Builders of Canterbury, England. 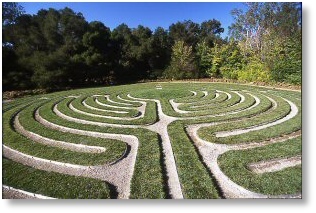 Right: Turf labyrinth, an almost full size replica of the Breamore Mizmaze, created for a private client in California, USA, October 2005. 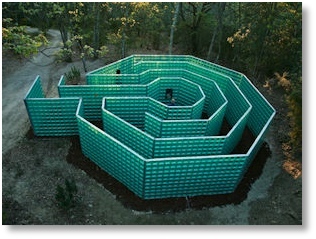 Left: Labyrinth of glass bricks, Chianti Sculpture Park, Tuscany, Italy. Designed by Labyrinthos, built by SEVES, May 2007.
of Yorkville, Illinois, USA, 2004. 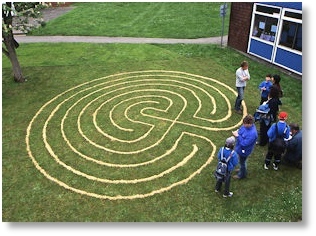 Right: Turf labyrinth, Meridian School, Comberton, Cambridge, a replica of the original Comberton “Mazles.” Design & construction by Labyrinthos and Sylvia Newman Garden Design, May 2007. 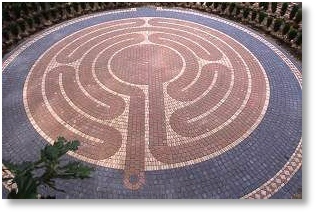 Left: Tiled labyrinth, Church of St. Michael & All Angels, Abingdon, England, 2008. Design by Labyrinthos, constructed by The Labyrinth Builders. Left: Turf labyrinth, York stone set in turf, University of Kent, Canterbury, England, 2008. Design by Labyrinthos, constructed by The Labyrinth Builders. here’s a page with guidance on labyrinth layout. Having worked with many of the leading designers and builders of labyrinths and mazes, we can also offer impartial recommendations for professional installations. Whatever the scale of your project, our services, experience and archives are available at a range of levels to suit your budget. and for details of our design and consultancy services. 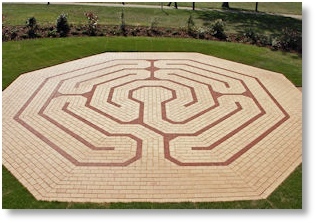 Left: Paved labyrinth, Springfield Hospital, London, England. 2011 Design by Labyrinthos, constructed by The Labyrinth Builders. 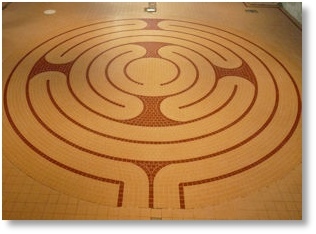 Right: Tiled labyrinth, Chislehurst Methodist Church, England, 2011. Design by Labyrinthos, constructed by The Labyrinth Builders. 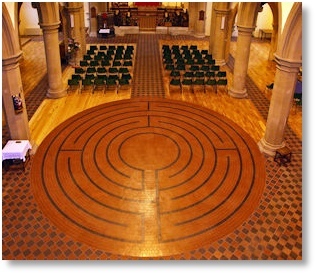 Left: Turf labyrinth, Mirfield Monastery, Yorkshire, England. Constructed by Labyrinthos, staff & volunteers, May 2011. 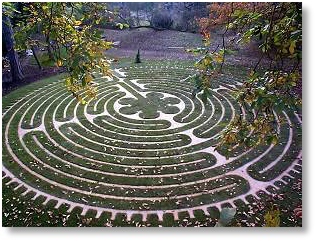 Right: Chicken feed labyrinth, BBC Gardener’s World. Constructed by Labyrinthos, Chris Beardshaw and a class of school children. 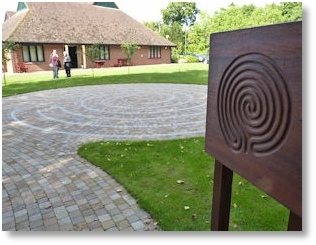 Right: Paved labyrinth, Princess Alice Hospice, Esher, England, 2013. Design by Labyrinthos, constructed by The Labyrinth Builders.